What a fantastic value in Rose Champagne. Tiny production! Joel Falmet is getting a new label. Same great Champagne, but new label. The distributor gave us a great price on the "old label" to move out before the new one arrives! Stock up now! Blood orange, red fruit and rhubarb on the floral- and spice-accented nose and on the palate. Taut and linear but fleshes out with air, showing very good intensity and finishing with lingering rose pastille and bitter cherry notes. Joël makes a small amount of rosé, about 160 cases per year. Joël’s rosé is made by adding aproximately 10% still red wine (100% Pinot Noir) to the blend. 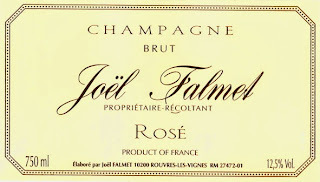 Dosage for the rosé is 12 grams per liter (to be called Brut, a Champagne must have less than 15 grams per liter). Every Champagne label must have a 2 letter code on it. You will find it in very small print followed by some numbers. It is estimated that about 85% of the Champagne are labeled with "NM". Only about 10-15% of Champagne is Grower Champagne. "RM" or Grower Champagne produces some of the most distinctive and finest Champagnes. There is a sense of "terroir" with these wines. The large Champagne houses buy grapes from all over Champagne to create their "house style" which has nothing to do with where the grapes came from. "RM" Champagnes are the production of a small family operation that takes pride in what they do and represents the land that the grapes are grown on. RM: Récoltant-Manipulant (maker) Known as "Grower Champagne. This is a producer that has control from start to finish. They grow their own grapes and make their own wine. All the grapes are grown on their own estate (they can purchase up to 5% to supplement if needed). These are usually small family producers that do not get a lot of publicity. NM: Negociant Manipulant (maker) Most of the big Champagne houses fall into this category. This means they purchase grapes from other growers and make their own wine. The also use their own estate grapes in their production. This has been the way Champagne has been made for hundreds of years. RC: Recoltant Cooperative. Similar to "RM" but they produce their Champagnes with the help of cooperatives. The grower sells his grapes to a cooperative to make the Champagne for them. CM: Cooperative Manipulant: Basically a group of growers sell their grapes to a cooperative and the Champagne is made there and sold through the cooperative. Sometimes they sell it to the big Champagne houses as grape must or even finished Champagne. Founders KBS arrives on Friday!